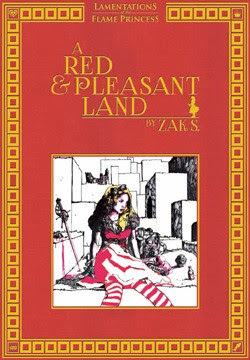 ﻿﻿﻿﻿Welcome to a review of A Red and Pleasant Land, a bizarre and beautiful setting book for Lamentations of the Flame Princess or just about any earlier edition (best for Basic or 1st Edition), or clone of Dungeons and Dragons (D&D) you might be playing. This review concerns the portable document format (PDF). For reference, I have a first edition in print as well. A Red & Pleasant Land was released in 2014. In 2015 it was awarded four ENnie awards; two gold: Best Writing and Best Setting, and two silver: Product of the Year and Best Adventure. 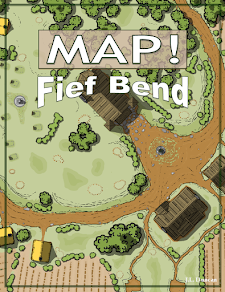 The PDF is available at drivethrurpg.com and rpgnow.com. 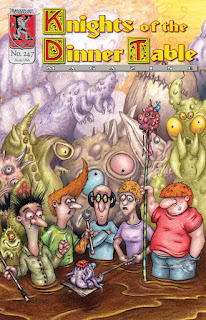 The print version is available on the Lamentations of the Flame Princess site (lotfp.com), among other places. The company is based in Helsinki, Finland. Disclosure: This review includes affiliate links to DriveThruRPG.com. I receive a token % if you make a purchase through the landing page. Thank you for your support. A Red and Pleasant Land is a difficult book to review, but thankfully not for the usual reasons. First, it is unique. Second, the maps and the illustration style are more impressionistic and almost abstract in spots rather than clean. Third and arguably most important, the book doesn’t endorse, nor does it resemble your Grandfather’s or your Dad’s D&D setting. It is a mash of strangeness, inspired by Lewis Carrol’s Through the Looking-Glass, with vampires replacing the principle ruling class, for reasons of which I’m uncertain (other than, why not). In case you are thinking it, the book is not of your favorite D&D setting (Greyhawk, Forgotten Realms etc.) meets Ravenloft, by any sense of comparison. Honestly, it doesn’t even try to do this. As a product, it is a very specific and very strange sort of thing. It is thoroughly, an interesting book cover to cover. A Red and Pleasant Land is a setting and adventure book. If Lewis Carrol, Bram Stoker and John Eric Holmes decided to take a road trip in a Cooper Mini, because what else would these fine time-traveling gentlemen have to do on a random Tuesday… A Red & Pleasant Land would be the title of the made for TV movie, about such an adventure. The setting is the war torn Place of Unreason, formerly known as the Land of Voivodja. In the north is the Card Castle, the rule of the Heart Queen Elizabeth Bathyscape. To the south, The Looking Glass Castle; the red house of the Red King, Vlad Vortigen. A war between these two vampire houses has gone on an indefinable amount years, months, or days upon the player characters arrival. The cause of the war is unknown. And to the last two points, and like so many other features of this book, these elements are left open for the Referee (Ref) to determine as they choose. Wherever The Place of Unreason fits in the Ref’s campaign world, it is hidden and difficult to access. To the north and east it is shadowed by the Carpathian Mountains, while to the south and west forested by the Terrible Goblin Wood. The human population has been severely decreased by the vampire presence. The setting is a strange caricature (of an already strange land) of Wonderland, the world as its best represented in Lewis Carrol’s novels, Through the Looking-Glass and less so, Alice and Wonderland. The terrain is divided by square-like a chessboard, though unlike Through the Looking-Glass the means of division are more to do with the altitude or height (or lack thereof) of each square, rather than by division of hedge. The terrain is left to the Referee to decide how these varied altitudes connect or even if they connect be it by portal, bridge, stair, ladder or earthly passage. The squares are unique unto themselves, the characteristics of which will be mostly left for the Referee to fill in via useful series of tables. Through a looking glass is the Quiet Side (the above mentioned is the War Side), which is a mirrored reality. It is a place the gods can’t see (so clerics can’t cast spells) and where vampires don’t exist (lack of reflection). Only the Red King and his Red Brides can cross to the Quiet Side willingly, for but a moment. The Red King uses this ability, and falls to immediate to sleep there, and so that his rest is safe and undisturbed. Lesser vampires use mirrors to call out and lure humans from the Quiet Side for a meal. The Heart Queen can make an appearance if her name is called three times. The Player characters are very limited by the amount of time (mere seconds) they can inhabit the Quiet Side; the silence drives them mad, but like the Red King they too can keep their sanity if they can will themselves to sleep… Rest, keep their sanity, and hopefully be rescued. Almost every being who exists on the War Side has a Quiet Side equivalent and still does even after they are slain. The Land of Unreason is a rich with unique character and monsters encounters. Most of the outlandish interactions, which are natural choices to those familiar with the fictional works of Lewis Carrol are therein, and have a chapter (and stats) dedicated to them. Admittedly, while it had been sometime since I’d read Alice and Wonderland and Through the Looking-Glass, (which, I did blow the dust off both) the author has left few stones, if any, unrecycled. There is even an opportunity for player characters to make an Alice, the settings only offer of a character class, but one that is more than worthy and a perfectly quirky fit for the setting. Adventure and nonsensical randomness, is generated through a respectable amount of tables. While use of these tables is enticing, but not required, their utility is indisputable; and entirely built to strengthen the setting. 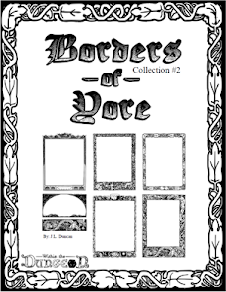 Many of these can be stripped of their nonsensical elements and reutilized for any system, but the most impressive thing about them is the way the author has reversed engineered Carrol’s work for use as an RPG supplement. One instance of this is that items are occasionally referenced with the following descriptor, I’m paraphrasing: “Items or furniture of this room are worth two or three times their weight in gold.” While this descriptor might be an affront to old school sense or game ability (coin = experience), its use made me put my put my Dungeon Master hat on (don’t you have one of those?) and ask why? After that, I found myself imagining the Red Kings favorite arm chair (the one worth three times its weight in gold) recently gone missing and the player characters hired to find it. Or reading the line straight to my player group, just to see what they would make of such a simple, yet odd concept. Was this what the author intended? Am I a reading a bit too much into this simple turn of phrase? That’s likely. But still, and like Carrol’s work, a weird and well placed phrase (or unsolvable riddle) is a perfect fit for this strange and dark world. And better than this, it gets the reader or in this case the DM thinking. There are two print errors of note: the handouts for Fragment 6 and Chess Puzzle are missing. If you pick up the second printing I have no idea if these were amended. With the PDF these errors are nonexistent. In conclusion, A Red & Pleasant Land is certainly strange and has some awesome features that with a little, “do it yourself,” you can plug and play with most RPG systems. The stranger elements don’t really journey to far from the inspired source material. The specific way these elements were engineered for the purpose of an RPG supplement is very well done. At the same time, if you’re in the market for a product with a more standard old school approach, the niche and strangeness of the Through the Looking-Glass setting, with vampires added in for flavor, might not appeal. Apart from all the above, while the review style for this column doesn’t usually point out the finer and more subjective aspects of composition, this book is literally one of the most unique and interesting RPG products that has graced my table… And (I cannot help myself, but) unlike D&D 4th Edition, the awards are well deserved. Like & Follow My Facebook; for RPG Reviews & Opportunities to Write for the RPG Industry!